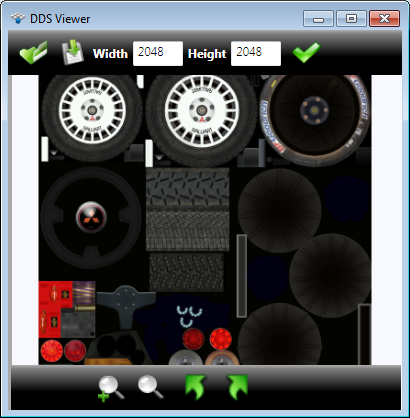 DDS Viewer is a free for use software tool. DDS Viewer can be used to open Microsoft DirectDraw Surface files, display image preview and provide options to convert, resize and save them in other most known image file formats as .jpg, .gif, .png and others. DDS or DirectDraw Surface today is a standard for storing data, compressed with S3 Texture Compression (S3TC) algorithm. This makes the format useful for storing graphical textures. DDS or DirectDraw Surface today is a standard for storing data, compressed with S3 Texture Compression (S3TC) algorithm. This makes the format useful for storing graphical textures and cubic environment maps as a data file. What DDS Viewer can do? Opened DDS image file can be converted/saved in other image format as JPEG(.jpg), Bitmap(.bmp), PNG(.png), GIF(.gif) and TIFF(.tiff). Qweas is providing links to FREE DDS Viewer 3.2 as a courtesy, and makes no representations regarding FREE DDS Viewer or any other applications or any information related thereto. Any questions, complaints or claims regarding this application FREE DDS Viewer 3.2 must be directed to the appropriate software vendor. You may click the publisher link of FREE DDS Viewer on the top of this page to get more details about the vendor.